The Fourth Judicial District Commission on Judicial Performance voted 4-1 finding that El Paso County Court Judge Christopher Edward Acker DOES NOT MEET PERFORMANCE STANDARDS. There was one recusal and three other members did not vote because they could not attend Judge Acker’s personal interview. 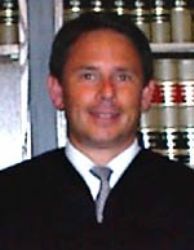 Judge Acker was appointed to the El Paso County Court in March, 2003. He received his undergraduate degree from the University of Northern Colorado in 1981, and his law degree from the University of Santa Clara in 1987. Prior to his appointment to the County Court, Judge Acker was in private practice in Colorado Springs, Colorado. His practice focused on real estate and juvenile law. The Commission met with Judge Acker for a personal interview, observed him in the courtroom, and reviewed his self-evaluation, survey results and a number of the Judge’s written opinions. Judge Acker’s docket includes criminal misdemeanor and traffic cases, and civil cases. Attorneys and non-attorneys responded to a survey about Judge Acker. Sixty-two percent (62%) of the attorneys and sixty-two percent (62%) of the non-attorneys stated that they believe that Judge Acker meets performance standards. The Commission feels differently. The Commission is troubled by the scores in the survey as well as the comments of respondents. The low scores and comments received by the Commission are consistent with prior reviews conducted by the Judicial Performance Commission. The survey asked respondents to rate judges on a 4.00 scale in the areas of Case Management, Application and Knowledge of Law, Communications, Diligence, Demeanor and Fairness. With one exception (Diligence), attorneys rated Judge Acker below average in every category. The ratings among non-attorneys were even lower. Judge Acker’s demeanor and apparent lack of compassion for those that appear before him are of grave concern to the Commission. Attorneys gave Judge Acker a score of 2.79 for demeanor as compared to the County Court Judge average of 3.28. At the same time, non-attorneys scored Judge Acker at 2.56 for demeanor as compared to the average of 3.56. Non-attorneys gave Judge Acker a score of only 2.2 on the question of whether he had a sense of compassion and understanding for those that appear before him. Based on the survey, the comments received from survey participants, observations of Judge Acker in court, and from his comments at the personal interview, the Commission finds Judge Acker to be a rigid or formulaic jurist who fails to provide the type of individualized attention and due process to which parties are entitled. The survey results include comments regarding Judge Acker’s apparent lack of neutrality, and that he can be condescending and rude to those who appear before him. In the past, the Commission considered such comments to be aberrational. It can no longer do so. Such conduct is not acceptable. Accordingly, the Commission concludes that Judge Acker does not meet judicial performance standards and should not be retained as an El Paso County Court Judge. Judge Christopher Edward Acker’s Response: I have been honored to serve as a law and order judge for almost 16 years. I have not been overturned on appeal in a criminal case in well over a decade, which shows I understand the law and follow it. I refuse to legislate from the bench. Following the law does not equate to lacking compassion. My primary concern, however, is about justice for victims while providing a fair courtroom. I incarcerate dangerous drunk/high drivers, and hold accountable probation violators. Almost 2/3 of those who appear in front of me, attorneys and non-attorneys, agree I meet judicial performance standards.